Dean Griffin (Kerry); Aoife McCabe (Monaghan) and Anna Leonard (Limerick). 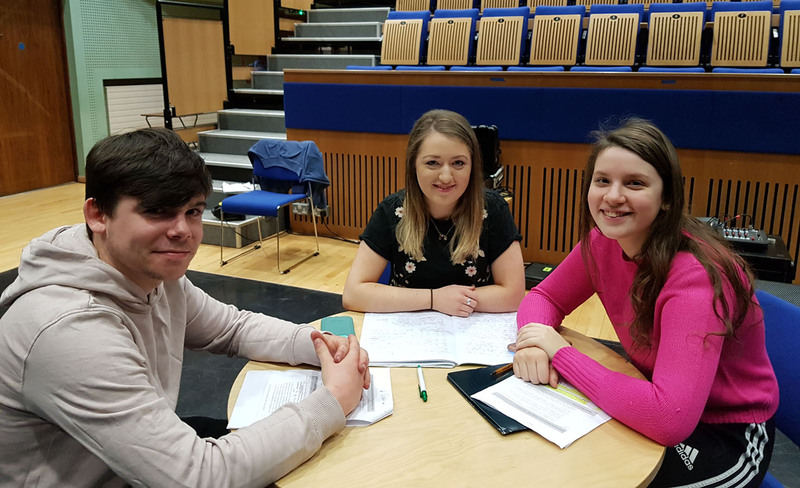 First year students from the Irish World Academy of Music and Dance at University of Limerick are presenting the new music series Ar Bhruach na Sionainne on RTÉ Raidió na Gaeltachta as part of the station’s summer schedule. The series title means ‘on the banks of the Shannon’ where it was recorded on the UL campus. The series includes music and song from the students, their friends and family, former students, and academic staff at the university. The programme is broadcast every Monday at 4.30 pm, and live online or in podcast form at RNAG. All students on the course must study Irish for the first year and a half, and Irish lecturer and piper Máire Ní Ghráda was instrumental in this initiative, together with RTÉ Raidió na Gaeltachta broadcaster Áine Hensey, who produces the series. Some of the guest traditional musicians in the series will include John Carty, Eileen O’Brien, Róisín McGrory, Sandra Joyce, Marty Barry, Keelan McGrath and Gearóid McNamara. The students presenting the programmes are: Michaela Kissane (Kerry), Rachel Walls (Dublin), Maeve Walsh (Cill Chainnigh), Katie Nee (Galway), Darragh Carey-Kennedy (Tipperary), Aoife McCabe (Monaghan), Anna Leonard (Limerick), Dean Griffin (Kerry), Seán Kelliher (Kerry), Sarah Dennehy (Cork), Loretta Coyne (Galway), Eimear Murphy (Tipperary), Laura Doherty (Longford), Chloe McCarthy (Kerry) and Deirdre McGrory (Donegal). Ar Bhruach na Sionainne is broadcast on Monday at 4.30 pm on RTÉ Raidió na Gaeltachta. See also the RTE-RnaG website for further publicity.